Spirals show up everywhere from fractals to nautilus shells. Software developers know the spiral as iterative development--a model in stark (positive) contrast to the old linear waterfall model. One huge problem with the waterfall model is that in its traditional form, it's not based in reality. It assumes that it's entirely possible for each stage to be done perfectly (and permanently) and then thrown over the fence (or cubicle wall) to the next group in the system. Nice theory, that. The guys doing the requirements finish their job and then, hey, they might as well all go on vacation. Their work is done. And so on down the line until the product is delivered to the users. The name itself (waterfall) describes the key limiting characteristic of the waterfall model--it's one way only. Water doesn't go back up. User experience designers (especially with games) often use a spiral model to keep cycling the user through stages of interest/motivation, engagement, and payoff (I described the user experience spiral here. But where software developers and game designers use the spiral model, learning designers (teachers, instructional designers, tech book authors) often don't. Yet a spiral model most closely matches how learning really happens. By teaching a topic completely in one section/chapter, there's probably way too much cognitive overload. When learning a new programming language, for example, do I really need to learn every possible way to write a loop before I can move on to, say, object interaction? If you teach me only a for loop, for example, I can just move on to what I really want to do... repeat something (or iterate over something). By taking the "now we're on loops, so let's look at ALL the details of EVERY kind of loop syntax..." you've just postponed (delayed gratification) what I really want to do-- use a loop to do something interesting. Give them the minimum new knowledge and skills needed to be creative. 1) Get me interested (make the case for why I should be motivated to learn this). 2) Give me a challenging and engaging activity (learning this new thing). 3) Give me the payoff/reward for having learned this (let me apply what I just learned to something interesting and meaningful, or at least fun). 4) Repeat with new thing that builds on what I now know. By taking an iterative--rather than linear--approach to each topic, the learner gets to do more interesting things more quickly. If you force me to do each topic to death before moving on, I might have to wait until the frickin' end of the book or course before I can actually do anything really cool. And that's a motivation killer for sure. And without motivation, learning suffers dramatically. How many of us have left a course knowing that we were exposed to a lot of content, but we still can't actually do anything? Another benefit of the iterative/spiral model for learning is that the spiral approach is much more forgiving. If the linear model relys on "we're only going to do this topic once, so you better pay attention!" and assumes that I've completely learned that topic before moving on (made less likely by the fact that I'm given too many details about the topic), then if I really didn't nail it, I'm screwed moving forward. But by iterating through the topic, I get another chance--potentially many more chances--to revisit the topic. So if I'm still a little fuzzy on the details the first time through that topic, then when it comes up again in a later iteration of the course/book, I get another chance to get or reinforce more clarity. Maybe I didn't quite get it the first time, even though I was able to use it, but perhaps the new things I've done since the last time I saw this topic have given me a better perspective. So the second time we come back to it, I'm in a better place to ask the right questions and see this topic in a broader context. 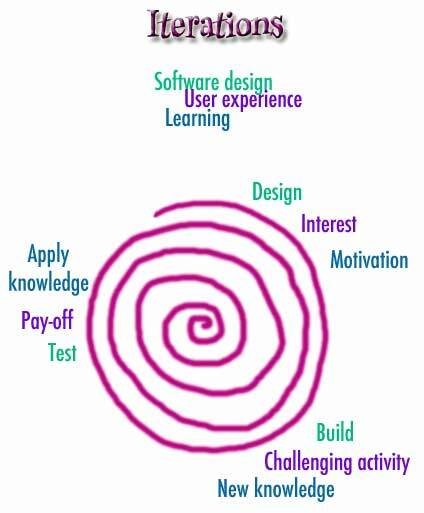 Learning should use the spiral experience model just as a game does. Each new thing I learn should be a chance to help me "get to the next level." Iterating through the topics means revisiting the same topic in multiple places (if needed). So each iteration through a topic gives me just what I need and no more to do something creative with what that new skill/knowledge. If I need to learn more before the course or book is done, then come back to it later... when it's needed for something new. Obviously I'm not talking about a reference book, but a reference book and a learning experience are wildly different beasts. They have completely different goals. The problem is that most books aren't really sure whether they're for learning or reference, or worse--they try to be BOTH. Reference books should be designed in a linear model. Learning experiences should be spiral. That's a dramatic difference, and you can't shoehorn a spiral experience into a linear format without weakening both. What's the minimum you can give them that'll let them be creative? Iterating through topics lets them do more interesting things more quickly. If they need more on a topic, they'll either get it later--on another trip through the spiral--or you can simply point them to a reference where they can learn the rest of the details when they need them. The point is, get them having fun and doing interesting things as quickly as possible! Makes me wonder how much easier it would be to learn another spoken language at age 34 if the spiral method were applied to the material (assuming non-immersion methods). It's painfully obvious to me that the linear method isn't very effective; no surprise there, to be sure. Spiral + emotional connection (mentioned in a previous post here somewhere) = no problem? "Spiral learning + emotional content = Fun". I love what you're saying here, Kathy, and I'm all for passion and enthusiasm, but I think that it's unethical to say that if you're enthused you'll make money writing technical books, which is kinda sorta your rebuttal of my own pragmatic observation on this subject. With precious few exceptions, even the very best writers, people who are enthused, passionate, engaging, excellent communicators, and even good marketers, can still produce flops. Ask your publisher about .NET books, for example, or XML books. This is a well defined expranation of spiral modelling.I think it can work wonderfully is software reuse.But can it work in linux kernel configuration.anyway i dont know.i would be much grateful if someone enlightens me on this.I mostly use waterfall model and am used to throwing the previous stage over the fence and when it come to review i and most of us have a hard time as we fight to beat deadlines.But i think spiral modelling is part of prototying since its itelative and prototying is itelative too.Maybe its debatable.but i hope someone out there can prove me right or wrong. This spiral learning theory is complete nonsense. It's obvious purpose is to prevent native intelligence or ability from distingusing itself. Laughably, the rigorus and logical thinking necessary for science and engineering does involve mastery of basics before moving on because the basics are necessary to foster creativity. Algebra and Geometery must be mastered before moving to calculus or differential equations as fundamental starting points. I was fortunate to have been publicly educated just after Sputnik at a time when there was no credence giving to stupid theories--either the brats learned it or they didn't. Some bad news is that in order to pursue science the basics have to be mastered anyway or the student will spiral down into failure. I believe swmohon's comment "This spiral learning theory is complete nonsense. It's obvious purpose is to prevent native intelligence or ability from distingusing itself." deserves the famous phrase attributed to Galileo in the old italian legend: "E pur si muove" (And yet it moves). Even if the learning methods we grew with were rigorous, it doesn't necessarily mean that we have to continue by inertia. As a matter of fact, even science believes in diversity (that's what research is for, I believe). So, even if spiral learning proposal could seem loose (it certainly isn't the one and only learning method), it may open new ways to make knowdlege more affordable against the "either the brats learned it or they didn't" rigid criteria out there. This is all very interesting to me. I know nothing about instructional methods, but find myself in a position of having to develop a cirriculum for 4 and 5 year old children. The packaged cirriculum available advertises the "mastery" method of instruction - linear? and also the spiral methods. This is why I started researching the two methods. And I'm sure there are more. Any feedback out there on what is best for the wee ones?